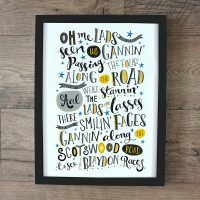 Ebony Newton’s range of stylish typography-based cards, mugs and prints were an instant hit when they went on sale at North East Gifts last year. A Cumbrian lass now living in Northumberland, she has adopted good old North East pride, which shows in her products. Ebony also designs greetings cards for some of the biggest brands in the industry. Where were you born? I was born in Carlisle and lived there for the first 3 years of my life. Where else have you lived? Newcastle, Gateshead, Leeds, Horsforth, Bramley, Headingley, Gilsland. Are your products your main job? No… I am primarily a freelance designer, primarily servicing the greetings card industry across many high street retailers. How did you get into making your own products? 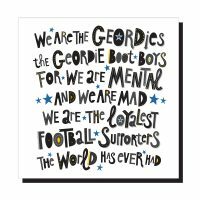 I created the ‘Geordie Boot Boys’ print for my husband as a gift about 7 years ago… he’s a toon fan and we were living in Leeds at the time, so thought it would be a nice little reminder of his team and home. When we relocated to Northumberland 5 years ago, he said I should try and approach some local shops with the print to see if they would stock it, and it just went from there. 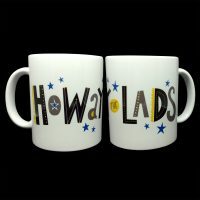 This was my first product, I now have a small range of prints, cards and mugs all on the theme of passionate toon fans. 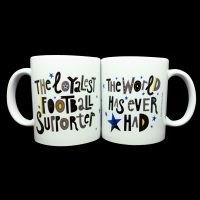 I however don’t even follow football! Whats the offside rule again? What’s coming up for you? I’m in the process of setting up my own online shop which will sell lots more of my own creations… watch this space! Best and worst things about being an NE creative? Best thing is feeling like I belong to a very passionate community of small independents in our region – the other work I do for big companies can feel very impersonal, and never really able to put my name to it. The worst thing… don’t really think there is a worst thing to be honest. 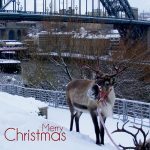 Favourite NE landmark? It would have to be the Millennium Bridge. It opened on the weekend I moved into my halls of residence (which was directly opposite) when starting my first year at uni. I still get a lovely feeling when I step across it, and nearly always take a photo when I’m half way over. Not sure when that will ever get boring. Favourite bar/restaurant? Love having a strawberry beer in the Forth on Pink Lane. Other NE creatives/brands you love? 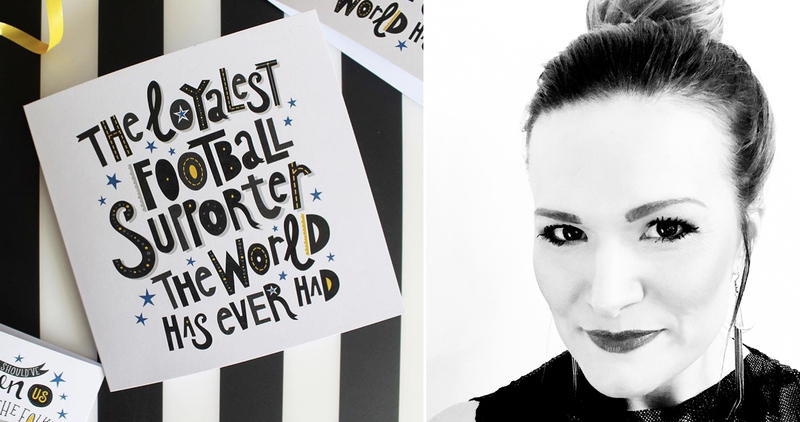 Sarah Farooqi – hugely talented illustrator. Wot Ma Like – I always bought Wot Ma Like cards when I was homesick in Leeds. Handmade by Lola Mac – beautiful unique jewellery.